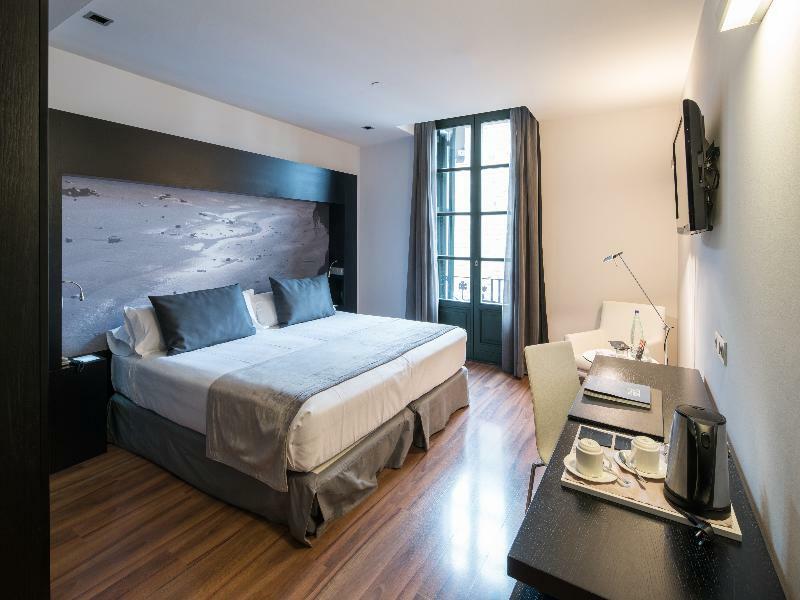 ﻿ Catalonia Catedral Hotel Barcelona. JIMAT di Agoda.com! Ada soalan mengenai Catalonia Catedral Hotel? Terletak di Gotic, Catalonia Catedral Hotel merupakan tempat menarik untuk memulakan pengalaman di Barcelona dan kawasan sekitarnya. Dengan lokasi hanya 1 km dari pusat bandar dan 15 km dari lapangan terbang, hotel 4-bintang ini menarik banyak pelancong pada setiap tahun. Persekitaran yang terjaga dan kedudukan berhampiran dengan Dalí Escultor, Font de Santa Anna, College of Architects of Catalonia, Picasso Wall memberi hotel ini daya tarikan istimewa. Ambil kesempatan daripada pelbagai perkhidmatan dan kemudahan yang tiada tandingan di hotel Barcelona ini. Hotel ini menawarkan pelbagai kemudahan di lokasi untuk memuaskan hati tetamu termasuk yang arif. Alami bilik dengan kemudahan berkualiti tinggi sepanjang anda menginap di sini. Sebahagian bilik menyediakan televisyen skrin rata, internet wayarles, kolam renang peribadi, internet wayarles (percuma), bilik larangan merokok untuk memudahkan tetamu berehat dan kembali bertenaga. Hotel ini menyediakan kemudahan rekreasi yang baik seperti kolam renang terbuka, taman untuk membuat penginapan anda benar-benar tidak dapat dilupakan. Nikmati perkhidmatan yang sukar ditandingi dan lokasi benar-benar berprestij di Catalonia Catedral Hotel. Apabila menempah 4 bilik atau lebih, polisi berbeza dan bayaran tambahan mungkin terpakai. Polisi ini dikuatkuasakan oleh pihak penginapan. Untuk tempahan sebanyak 8 malam atau lebih, syarat khas akan dikenakan. Pihak penginapan hanya membenarkan seekor haiwan peliharaan (anjing atau kucing) dengan berat kurang dari 20 kilogram. Perkhidmatan ini perlu dimohon lebih awal dan dikenakan caj tambahan sebanyak EUR 10 seekor semalam. Bagi tetamu dengan haiwan peliharaan, cagaran sebanyak EUR 200 diperlukan semasa tiba untuk caj sampingan. Jumlah ini akan dikembalikan sepenuhnya semasa daftar keluar selepas penginapan diperiksa. Stayed in room 302 which is a standard room, two singles made into a double bed but comfortable, large bathroom. The only negatives were that the air conditioning made a ringing sound so I had it on only when out of the room, and the room overlooked a square which was a little noisy at times with street entertainers. Would stay here again. I am more into trying out restaurants than sightseeing which I have done on previous trips to Barcelona, still the hotel is in a great location for sightseeing and shopping but also great for restaurants. I would recommend Milk for breakfast which is about 5 mins walk. The Vietnamese restaurant behind the hotel Bun Bo is good for an informal meal, tasty food, friendly service. La Locanda is also nearby and serves fresh Italian food, good service and atmosphere, reasonably priced. Matsuri Japanese is good, try the sushi rolls with banana in them - different and worth a try. Lonja de Tapas in the Borne area has been around for years and I have always been more than satisfied when I have dined there. This is a cosy hotel in a great location with modern facilities. The breakfast offering is simple, delicious and includes fresh local delicacies. It's located within walking distance to most of the city's major attractions. Although it's located in the center of the city's busiest neighborhood, there is no problem with noise. 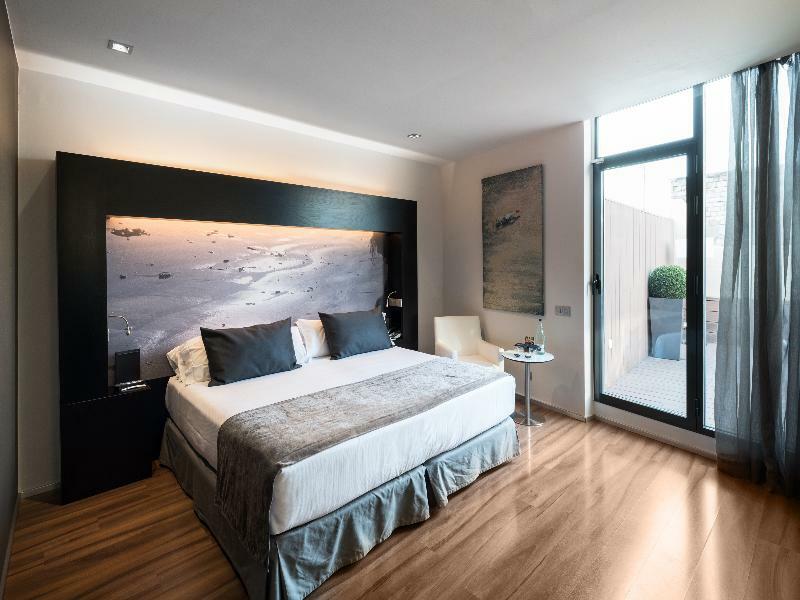 i suggest this hotel for travellers that really look to explore the city, especially the gotic areas! it was our first time in barcelona and we very much enjoyed the close proximity to most of the central tourist areas, such as la rambla, gotic, and the 2 gaudi houses. furthermore, its very close access to some of the more known tapas restaurants, la boqueira market, and other good food joints. room was small, but that's par for the course in most european hotels. i think considering everything, its worthy of a couple's vacation choice if they're without kids and also for a group of friends travelling together. 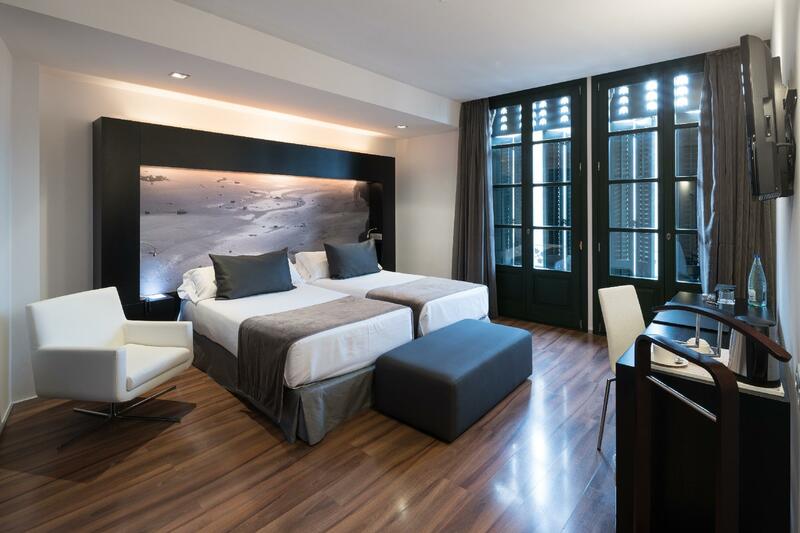 The Catalonia Catedral hotel is conveniently located in the heart of Barcelona's Old Town. 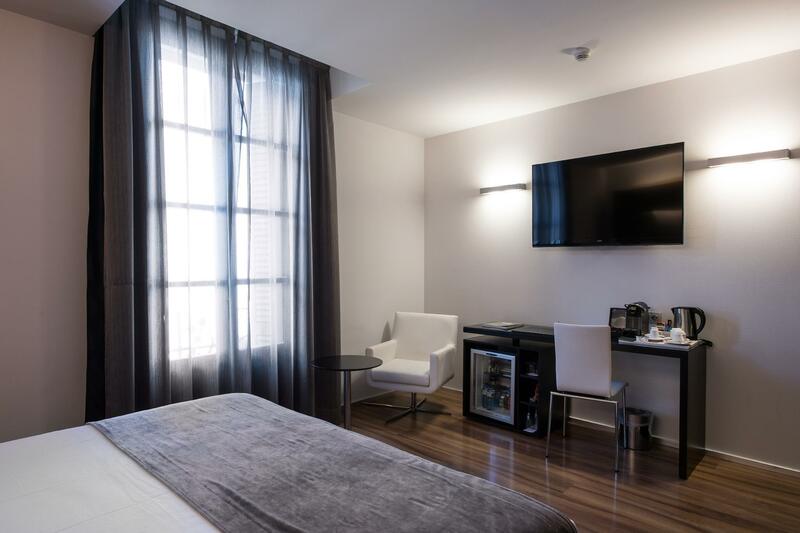 It is only about 10 mins walking to La Ramblas, 5 mins walk to the grand Cathedral, 10 mins walk to the luxury shopping district. Surrounded by retail shops and restaurants, this hotel is a great value for money. A definite recommendation for travelers! Short work from the central transport hub (Pl. Catalunya). All the staff recommendations were fantastic: they were friendly and helpful. The beds were very comfortable and the facilities very clean and in excellent repair. I loved everything about this hotel. The staff went out of their way to be pleasant and helpful, the ambience was "cool," and the room had everything I would want. The location if in the middle of everything! Very nice hotel, completely updated . Modern decor. Rooms are large,very quiet ,beds very comfortable.Restaurant and bar on site. Breakfast buffet available for an additional charge. Great location in Gothic area, easy walk to many restaurants and the Las Rambles shopping area. Perfectly sited for exploring the Gotic area (and the rest of Barcelona as it's a very accessible city with great transport, as well as being very walkable) and yet really quiet for sleeping. The staff are welcoming and friendly and the hotel has a lovely atmosphere. I thought breakfast at 19 Euros was expensive so chose to eat elsewhere as there are numerous places to eat in this area. The swimming pool on the roof is an added bonus for travellers visiting when they need to cool off after a hard day exploring this wonderful city! We ordered a terrace room but got without because a mistake in agoda's site. The hotel got reservation without terrace . Something about the interface between Agoda and the hotel. We don't have any complains to the hotel team. Great hotel, with an amazing location! Front staff was very friendly, especially Angel! Only downside was the pool area was always full every time we went up, all the lounge chairs were taken. Little disappointing after a long day of sightseeing! Otherwise, highly recommend! Stayed in a superior room which was more than large enough for a city hotel, modern and clean. Beds very comfortable. Pool is only small and not very deep (just over 1m) but great for cooling down rather than swimming lengths. Location is a stone's throw from the cathedral, but the hotel is quiet inside and the little street noise there was from nearby bars and restaurants (at the rear of the hotel) stopped around 11pm. I would stay there again without hesitation. The location is fantastic, the hotel is what you'd expect for the money, staff are pleasant. My only real complaint is the same as many hotels the kitchen staff put out loads of cooked food at once rather than cooking to order, for the price of breakfast you'd expect it cooked to order! 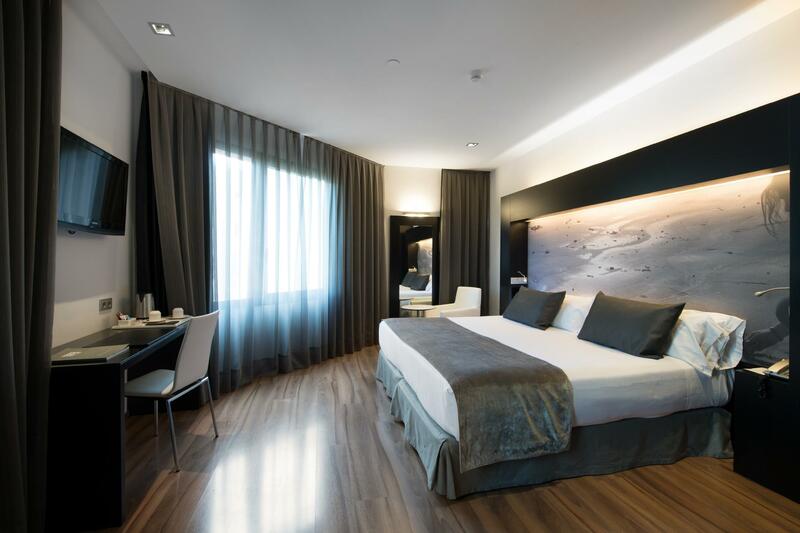 The location of the Catalonia Catedral cannot be beaten, and its a modern, impressive and comfortable hotel. The rooftop terrace and pool is excellent. The only problem was the strength of the wifi connection - we had to check our emails from the bathroom! Our room was very clean, quiet, comfortable and well appointed. The staff was friendly and helpful. During our stay, Barcelona was hosting the semifinal game of the soccer league. It was pleasant to get a peaceful night of sleep despite all the revelry on the city's streets. The Catalonia is conveniently located and close to most places of interest for visitors. Cool, zen design of the hotel was fantastic, superbly friendly staff. Breakfast was simply tasty and well provided. Location was fabulously convenient. But our room had no natural light so we were happy to stay only for a really short two nights. My wife and I had a long weekend in Barcelona for as part of her birthday present. I had arranged in advance for a bouquet of flowers to be in the room as we arrived. The reception staff were really helpful in arranging this. The location of this hotel is spot on. I think that you pay a premium for the location, but there is no complaint about this. The room was clean, quiet and of an adequate size. We particularly enjoyed the roof top swimming pool. I agree with other postings from guests that breakfast is probably better taken from one of the cafes nearby. If I had one complaint it would be that I couldn't get a drink at the bar on Saturday night as the member of staff on the bar was too busy serving drinks in the dining room. I gave up after a 15 min wait! I would strongly recommend this hotel. Couldn't be better. Helpful friendly staff, clean rooms. A little small but efficiently laid out. Very quiet inside the hotel, even though it was in the center of all the action. Regardless of outside temperature, which can be suffocating, the whole hotel was comfortable, with good a/c control in room. 2 laptops in the bar were always available. Wi Fi didn't always work on my phone, but no big deal because of access to Internet through the laptops. I highly recommend this hotel! 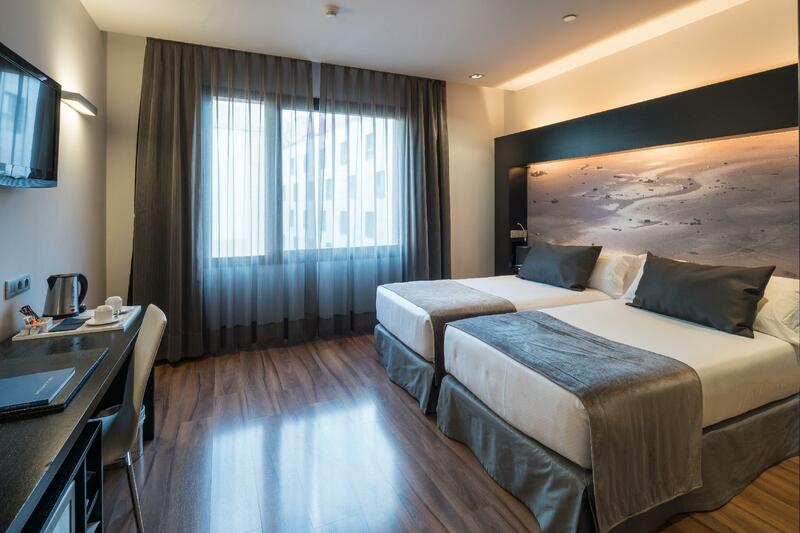 This is a very nice hotel in a great location, close to both the Catalunya and Licieu metro stops. Although it is in the midst of busy Gothic, the room was very quiet with no outside noise. The staff were very helpful, particularly in helping me with the wifi, which initially was not working with my ipad. The room was very nice, with a big comfortable bed, and big bathroom with rain showerhead. However, the room as smaller then I would have expected for the price of this hotel. The bed took up most of the space in the room. For the discounted price, this hotel was very good. Staff are helpful and friendly, Catedral de Barcelona is round the corner, 3 mins walk to the main area (Catalunya Plaza), lot of shops near the hotel, very centrally located, nice swimming pool with very good air conditioning, friendly and attentive staff, very convenient, 5 - 10 mins walk to La Ramblas and 25 mins walk to the beach, 5 mins walk to airport bus and sightseeing tour bus, very good hotel. Very clean room and they Organise city walk as well, very helpful to tourists.